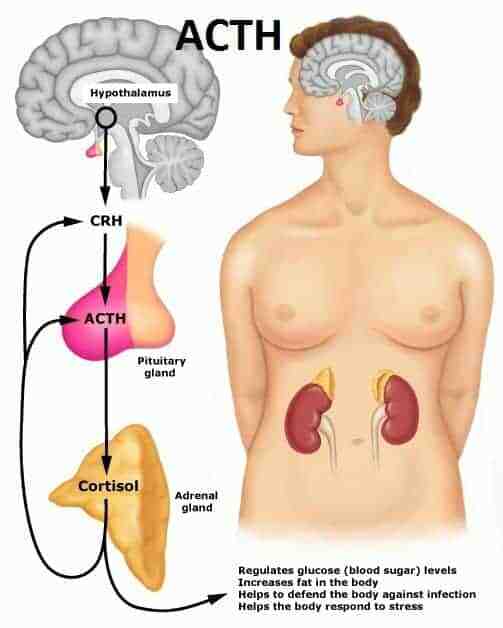 Cortisol is a glucocorticoid hormone that is secreted by the adrenal gland. 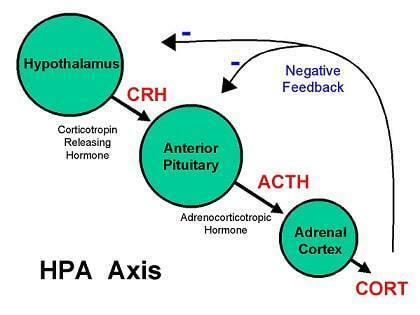 There are two types of Cortisol plays a key role in what is known as the hypothalamic-pituitary-adrenal axis (HPA ﻿﻿﻿axis). Your stress response system is sometimes more commonly referred to as your "fight or flight" response and more recently as the "flee, fly or freeze" response. Cortisol also plays a key role in a number of other basic biological functions, such as your sleep/ wake cycles, maintaining blood sugar levels and combatting fatigue during the day. Reactive cortisol levels, which are increases in cortisol in response to stressors. One of the primary functions of many of our biological systems is to maintain something called "homeostasis". This means that our body has certain optimal levels that it seeks to maintain such as a steady heart rate, temperature, blood sugar levels and oxygen levels. When our temperature rises, certain systems - like sweat glands - spring into action to bring down our body temperature. It has been discovered that yawning - or taking in a giant breath of oxygen - is what happens when oxygen levels get too low, and if you suddenly develop a craving for something sweet, it may mean that your blood sugar levels are on the decline. One of the primary purposes of cortisol is to help your body regain homeostasis after a stress event. Biologically speaking, a stress event is anything which activates your flee, fight or freeze response (Source). For some people a stress event might be suddenly coming face to face with a mountain lion, while for others it might be when they hear the words "my mother is coming to visit indefinitely," or "I want a divorce." When you experience a stress event, your body releases adrenaline to prepare you to fight or flee (the freeze response is slightly different). Once the threat has been neutralized or minimized, cortisol is what helps stabilize your system once again - or regain homeostasis. While cortisol primarily affects the metabolism, prolonged imbalances in cortisol levels can lead to problems with our immune response, and even memory. Cortisol is meant to help the body destabilize after a brief event. 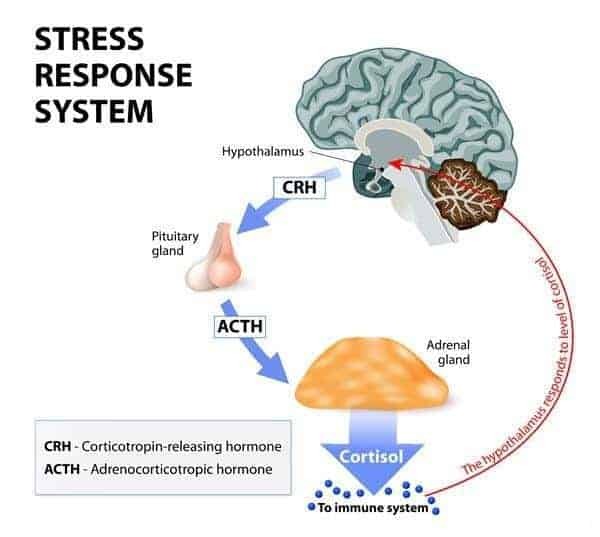 When stressors in our life continue indefinitely, they can send our cortisol levels spiraling out of control, which can have a deleterious effect on a number of other biological systems. 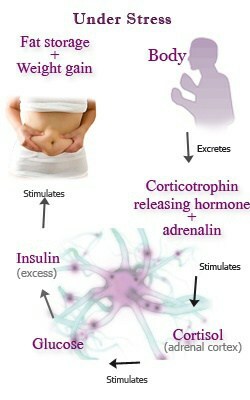 How Does Cortisol Affect Our Body? 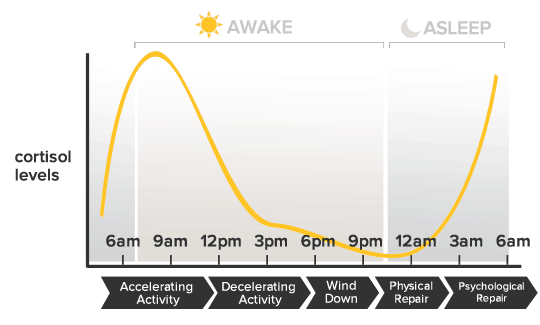 Sleep/ Wake cycles or "circadian rhythms"
Cortisol plays a key role in many of our basic biological functions: from sleeping to eating to keeping us from having a panic attack. Here is a breakdown of some of the key roles that cortisol plays in the body. If you generally get up at the same time every weekday morning and have noticed that you can't sleep in on weekends, this is cortisol at work. Similarly, if you've ever noticed that when you have to get up earlier than usual, you are groggy, out-of-sorts and just can't seem to "wake up" properly, you are also experiencing the effects of cortisol. When you wake up at a certain time every morning, your body will release a burst of cortisol right before that time, no matter what day it is. Conversely, when you wake up earlier than usual, you will have a harder time becoming alert because you haven't gotten your morning dose of cortisol to help you get up and running. In addition, cortisol is also released in a very predictable pattern throughout the day to help us maintain appropriate energy levels. We generally start the day with a cortisol peak early in the morning. Cortisol levels then slowly decline throughout the day, before rising once again in the early hours of night in preparation for their morning peak (Source). If you feel your energy levels rising and falling throughout the day, that is the result of cortisol at work. When "stressed" (your flee, fly or freeze mechanism is activated) your body prepares itself to flee or fight by sending a rush of epinephrine (adrenalin) and glucagon (sugar) into your bloodstream to give you a quick burst of available energy. At the same time, cortisol and growth hormone levels rise which causes muscle and fat to be less sensitive insulin which makes more glucose available in the blood stream. This is fine if you simply experience a few moments of fright before your levels quickly return to normal, but over a prolonged period of time, this can make you insulin resistant which can lead to developing type 2 diabetes. When you have type 2 diabetes, too much medication or insulin can cause low blood sugar, which is a common cause of stress (Source). When your blood sugars drop too low, your hormones spring into action and rapidly release epinephrine and glucagon, followed by a slower release of cortisol and growth hormone. 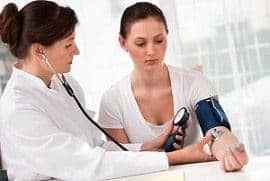 These hormonal responses often take place over a 6 to 8 hour period, during which time it can be difficult to maintain appropriate blood sugar levels. 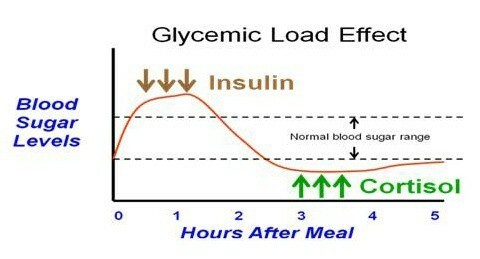 During this time blood sugar levels may rise and fall rapidly which is often called a “rebound” or “Somogyi” reaction. Stress causes an activation of your flee, fly or fight response which creates an additional boost of energy. 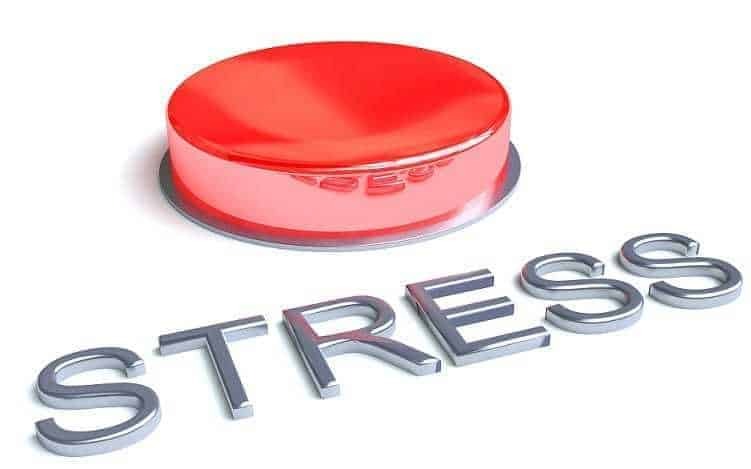 The problem is that when our stressors such as work related stress or the stress of going through a divorce, we tend to deal with that stress mentally, rather than responding with physical activity that would burn the extra energy provided by the cortisol surge. Your body can't tell the difference between fear caused by an angry mountain lion and ﻿﻿fear caused by an angry boss and it responds to both in the same way. Failure to burn off the energy created by a cortisol surge through physical activity can lead to cravings for foods high in fat and sugar - also known as comfort foods (Source). Unused stress energy is generally stored around the abdominal organs, so if you have a pear shape or a "spare tire" around your middle, this is generally a sign that weight gain is the result of stress. Accumulation of this type of fat, known as visceral fat, is considered one of the most damaging types of fat and can lead to higher rates of cardiovascular disease, high blood pressure and diabetes. Anyone with any remote knowledge of the AIDS virus understands the importance of T-lymphocyte cells (generally referred to as T-Cells) in the immune system. While you may not understand how they work, you probably know that the lower your T-Cell count is, the more compromised your immune system is. Cortisol blocks T-cells from proliferating, which lowers your T-Cell count. This can leave individuals suffering from chronic stress highly vulnerable to infection. The region of the brain where memories are processed and stored is called the hippocampus, which also happens to contain a great deal of cortisol receptors. While normal cortisol levels have no adverse effects on the hippocampus, excess cortisol overwhelms the hippocampus and actually causes atrophy. Studies have shown that elderly people with elevated cortisol levels display hippocampus damage which result in significant memory loss, but at what age this damage occurs is unclear. For those who are chronically stressed, however, there is good news - hippocampus damage is usually reversible. Student-Tutor a San Francisco SAT/ACT prep and tutoring company states: "In order to improve memorization skills, you need to keep a healthy brain by staying mentally active, socializing regularly, maintaining proper exercise, diet, and sleep patterns." Almost any activity which helps reduce or alleviate stress will also help lower cortisol levels to within normal ranges. These can include anything from simple breathing exercises to changing jobs to therapy or even just talking more about what is causing you stress. Obviously any physical activity such as yoga, tai-chi, boxing, running or any number of other activities is going to do double duty since it not only reduces stress but also provides a healthy outlet for the energy created by the activation of your stress response system. At appropriate levels, cortisol is an extremely useful hormone that helps us having energy throughout the day. It also helps protect us in a dangerous situation. In unhealthy levels, however, cortisol can have a damaging effect on a number of biological systems. Reducing stress and keeping cortisol levels in check is a vital part of any personal health care regimen. What is Testosterone and How Does It Affect the ﻿﻿Body﻿﻿? What is Oxytocin and How Does It Affect the Body?